Hugely talented Huddersfield comedy actress Nalika de Silva brings to an end a year long tour of her intriguingly named hit show Me, Bill Nighy and the Goblin on Saturday night at Square Chapel, Halifax. The journey began at the 2014 Edinburgh Fringe where the show was recommended, and has since taken her to the West End of London among other places. 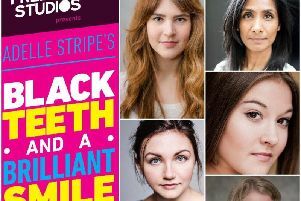 The show is a comedy coming of age as Nalika, armed with two key pieces of advice from her parents - (“drink tea” says her carefree Sri Lankan father and “make lists” says her outspoken Yorkshire mum) - heads to London to become an actress. It’s about what happens when big dreams are confronted with reality . The wonderfuly humorous show comes with tales of resting jobs, squirrel attacks, Bollywood dancing and bumping into superstar Bill Nighy. Nalika shares her experiences and brings to life the funny, odd, quirky and frankly bizarre characters she meets on the way. “The squirrel thing’s for real, he ended up living in my loft,” she says. The show also features Huddersfield’s Gledholt Male Voice Choir. Tickets are £8 and £10 from Square Chapel on 01422 349422.